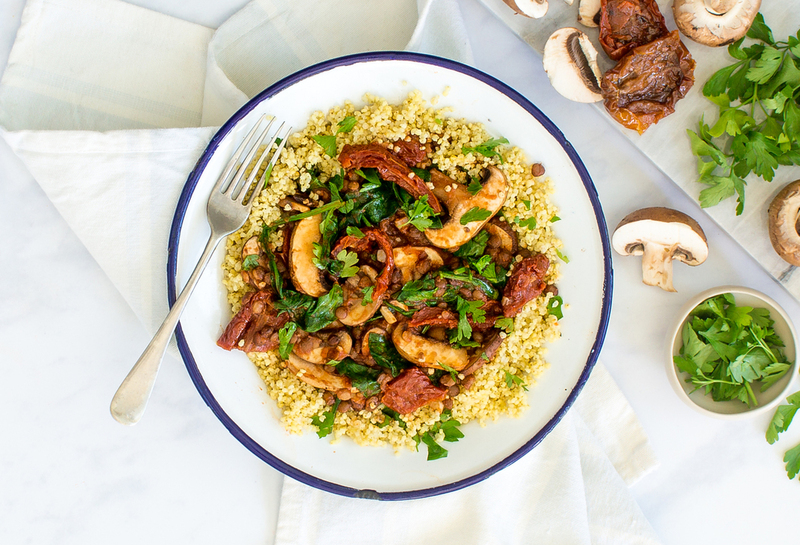 We thinly slice and brown these chestnut mushrooms with garlic before adding lentils and rich sundried tomatoes. Served on a toasted millet pilaf seasoned with parsley oil. 1. Boil a kettle. Finely chop or crush the garlic. Thinly slice the mushrooms and roughly chop the sundried tomatoes. 2. Heat a dry saucepan and pour the millet in before the water. Toast the millet for 2 mins, stirring constantly. Pour in 400ml boiling water, reduce the heat, cover and simmer for 15 mins. 3. Dissolve the vegetable stock cube in a jug with 100ml boiling water. Drain and rinse the lentils. 4. Heat a medium-sized pan with 1/2 tbsp oil on a medium heat and add the garlic for 1 min. Then add the mushrooms and sundried tomatoes for 3 mins. Add the passata, vegetable stock, lentils and spinach and leave to simmer for 5-10 mins until the sauce has thickened. Season with black pepper. 5. To make the parsley oil; finely chop the parsley and add to a bowl with 1 tbsp olive oil, mix well. 6. Drain the millet and season with a pinch of sea salt. Then fluff up the millet with a fork. Stir through the parsley oil. 7. Place the parsley millet on two warm plates and spoon over the sundried tomato and mushroom lentils.